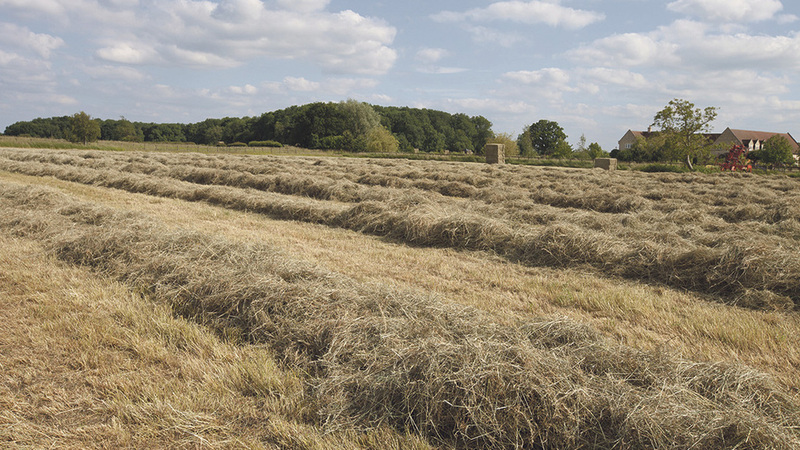 For Northants grower W.W. Old and Son, producing the best quality hay requires the use of efficient machinery combined with regular use of preservatives. Geoff Ashcroft reports. From Knuston High Farm, Irchester, near Wellingborough, W.W. Old and Son compliments its 600-hectare (1,480-acre) of combinable crops with a considerable haymaking workload. Each season, the family-run farm mows some 250ha (615 acres) of grass with the aim of producing about 6,000 big bales of high quality hay each season. Most of what is produced is sold around the UK to livestock producers, with a few bales fed on-farm to any over-wintered stock which arrives on a bed and breakfast basis. Being a time-critical and weather-dependent process, the farm’s haymaking workload is managed with the help of Baler’s Choice preservatives along with a key selection of implements chosen for their ability to deliver speed and efficiency. Martin (left) and Will Old are pleased with the quality and efficiency of haymaking at Knuston High Farm. Martin Old, who shares day-to-day responsibilities with his brother Will says: “Given the amount of hay we produce, we do need a bit of a guarantee when it comes to the weather. And while we cannot always rely on the British weather, we simply would not go out without filling the 400-litre applicator on the baler – it is like having a dryer in a bottle. “We have been using preservatives for about nine years now. Prior to using a forage preservative, hay-making was much more stressful. You could not guarantee much, and there was a lot to lose. And we have had our fair share of failed hay crops in the past. Nature is left to do most of the hay making work. The farm’s approach to perhaps the most traditional of forage-making processes is one which also has a heavy reliance on high-output machinery. Speed and efficiency are as essential as the use of preservatives. He says using the right equipment at the right time is vital and the process starts with two trailed Kuhn mower conditioners. “We need to make the most of drying time when producing quality hay,” he says. “The less time we spend in the field mowing and tedding, the more time there is for the sun to do its work. “Our preference is to mow early in the morning and then leave the spread grass to wilt,” he says. “We do not want to spend all day cutting grass – we need to get in and out quickly, and let nature do the work for us throughout the day. An almost obsessive approach is needed when it comes to seeking a suitable weather window for haymaking. 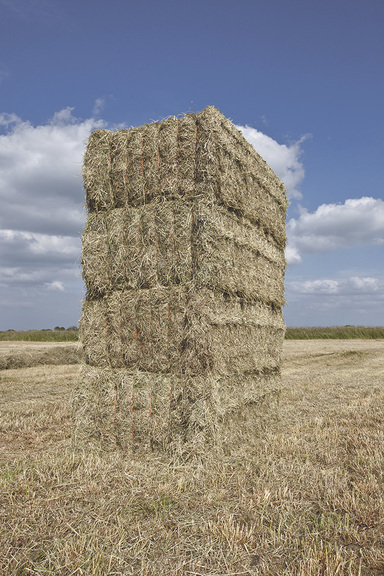 With the crop near its target moisture content of 22-28%, hay is put in swaths immediately in front of the baler. 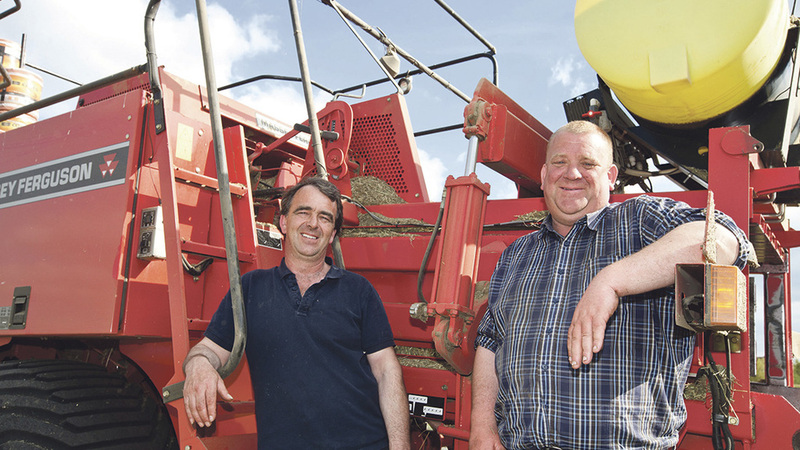 Once the process starts, Martin and Will make hay in 40ha (100-acre) blocks. Grass crops are assessed on an individual basis, but the rule of thumb is to ted on a daily basis using two Kuhn multi-rotor machines offering eight-metre and 10m working widths. Again, speed is the key, and moving crops quickly allows the sun to do the bulk of the work. 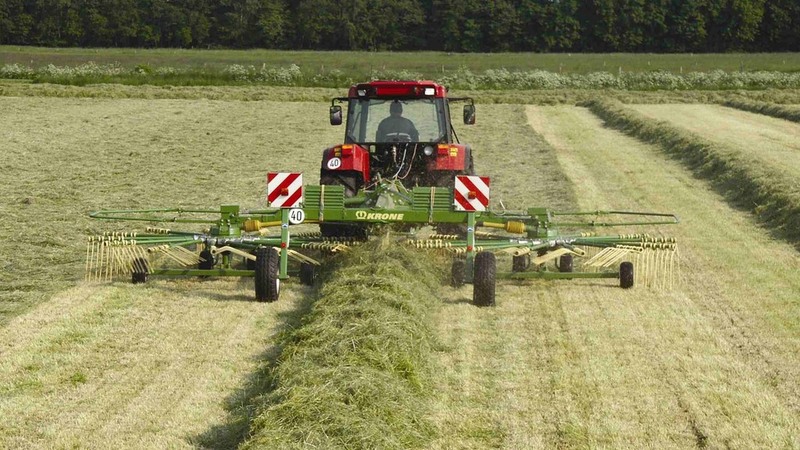 With the crop approaching its target moisture content of 22-28 per cent, hay is put in swaths using a Krone rake, immediately in front of the baler. From here, an MF186 large square baler creates 1,200 by 700mm section bales, most of which are 2m (eight feet) long. Quadro Pac creates a vertical stack of up to four bales and is fully automatic in operation, with manual over-ride available. Two moisture sensors monitor and automatically adjust the flow of preservative onto every bale, compensating for output and crop condition. It is a system which offers security when it comes to hay quality. The most recent addition to the Old’s machinery line-up is a Quadro Pac V square bale accumulator and stacker. Bought through the Big Bale Co, its ability to precision-stack bales to shorten field clearance times has boosted in-field logistics and transport. Towed behind the farm’s MF186 baler, the twin axle Quadro Pac creates a vertical stack of up to four bales and is fully automatic in operation, with manual over-ride available. As bales exit the back of the baler, they are propelled into the stacker using powered rollers. A set of lifters grab the lowest bale and lifts it, creating space for the next bale to sit below. The raised bale is then lowered onto the bale below and the process is repeated. Bales are stacked as they leave the baler, speeding up crop transfer from field to store. 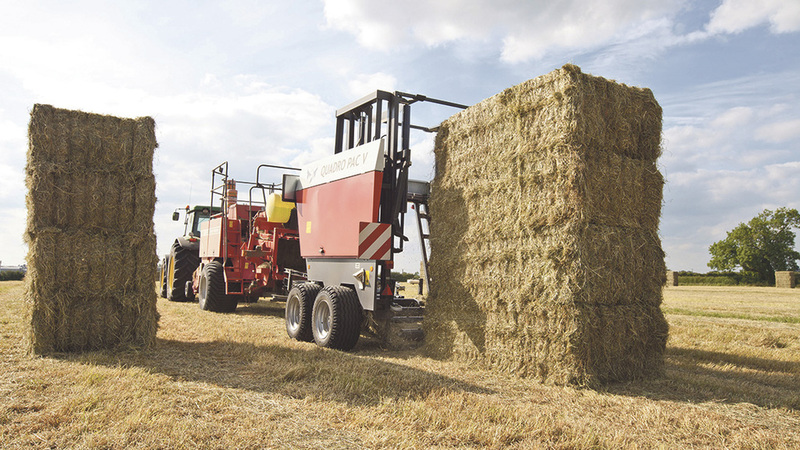 Once filled – the operator can determine the accumulation of one, two, three or four bales – the stack is lowered to the floor while on-the-move, allowing baling to continue uninterrupted. As fields are baled, Martin leaves packs of four bales stood for loading onto trailers, ready to be hauled back to covered storage at Knuston high Farm. “We have looked at many different systems and we have also tried a bale collector trailer in the past too,” he says. “But that simply did not work for us. When it comes to bale haulage, the farm has one 36ft trailer, two 40ft trailers and a 45ft trailer at its disposal. A brace of telehandlers – a JCB 531-70 and Claas Scorpion – take care of loading duties with the help of modified bale spikes, complete with high back frames to prevent bales from toppling backwards. Martin says the Quadro Pac stays permanently attached to the MF baler, and is equally as useful at harvest, for collecting and stacking straw bales. “This is the best bit of kit we have bought to improve in-field logistics and efficiency, though I had to have the stacker painted red to match my baler,” he says.